How do I recover my CELearningNetwork.com password? Go to our Learning Management System (LMS) Login page and click Forgot Your Username or Password? . There you will be asked to enter the email address associated with your account. We will email you a password reset link and instructions. How do I login in if I have a new email address? If you initially registered using a previous email address, you may still use it to login. Once logged in, update your email address by clicking on your name on the right upper corner of the screen will allow you to edit your profile, including your email address. Where can I print, or re-print my certificate(s) of completion? The link to your certificate of completion is visible below your course content link. While the link access will be subject to course completion restrictions, once you have successfully completed a course, access restrictions will disappear and you will be able to click on the certificate link and access your certificate of completion. You can print or download a copy of your certificate of completion. You may return to your course page at any time to obtain additional copies of your certificates. Where can I print, or re-print my receipt? After purchasing a course, you will be presented with a successful registration page. This page contains a link to download a PDF version of your receipt. In addition, you receive an order confirmation email. You may also login to your billing account and there you will be able to print individual receipts for each course purchase. Do you report continuing education credit to my licensing board/professional association? 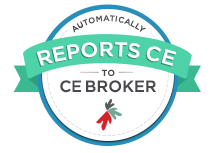 Florida Healthcare Professionals: CE Learning Network reports course completions instantly via CE Broker for most professions. Reporting will appear under the provider offering the course not under CE Learning Network’s name. For example, if you took a course offered by National Healthcare Institute (NHI), the report will show NHI as the reporting provider. Please be mindful that while we report course completions instantly, there may be a delay between the time we report to CE broker and the time the course completion appears on your CE broker transcript. The completion date reported to CE Broker may be viewed on your certificate(s) of completion. We always maintain a record of all activities you have completed with us. You may contact CE Broker at 1.877.434.6323 for additional questions. Georgia Board of Nursing: CE Learning Network reports course completions instantly via CE Broker for most professions. Reporting will appear under the provider offering the course not under CE Learning Network’s name. For example, if you took a course offered by National Healthcare Institute (NHI), the report will show NHI as the reporting provider. District of Columbia Board of Nursing: CE Learning Network reports course completions instantly via CE Broker for most professions. Reporting will appear under the provider offering the course not under CE Learning Network’s name. For example, if you took a course offered by National Healthcare Institute (NHI), the report will show NHI as the reporting provider. Iowa Board of Nursing: CE Learning Network ONLY reports course completions for the Supervisory Course for Iowa’s Licensed Practical Nurses. We submit certificates of completion daily to the Iowa Board of Nursing for this course. It is the responsibility of each individual nurse licensed in the state of Iowa to keep his/her course completion records. We always maintain a record of all activities you have completed with us. You may retrieve your course completion records by accessing your student account. How do I know if the courses offered by CE Learning Network are accredited/approved for my profession? Accreditation/approval information is available on each course detail page. Can I print the course materials to study offline? No. All our courses are web-based. However, you can access our courses using a variety of devices, including mobile devices and tablets. Where can I review my missed test questions? To review missed questions on attempted post-tests, you can click on the post-test link and the option to review the test will be available next to your grade. Why am I being asked to install Adobe Acrobat Reader? Adobe Acrobat Reader is a useful program, and is required to view several of the files throughout our website, including certificates of completion. Click on the link below to download Adobe Acrobat Reader for free. My course includes an ebook. How to redeem my eBook code on VitalSource? Does my ebook access expires? No. Once you download your ebook it is yours to keep for future reference. Which browser may I use to access CELearningNetwork? The following browsers are tested and approved to work seamlessly with the system. If you experience some issues wile navigating the website, please verify your browser version first. You may click on the links below to download the latest version of any of the internet browsers below.